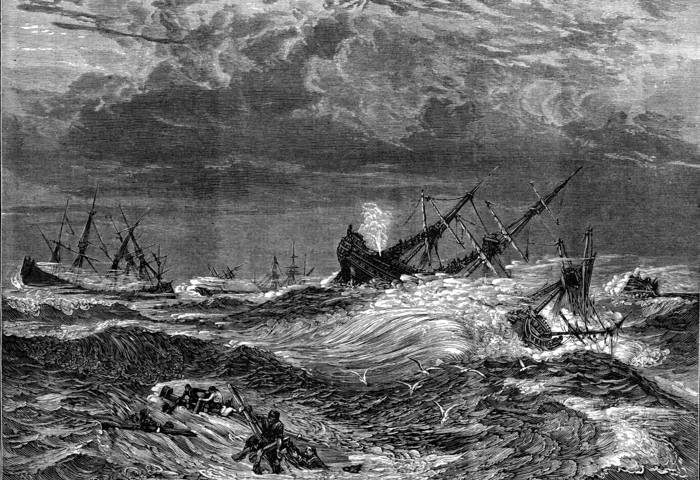 The renowned ‘Great storm’ of November 1703 hit the west coast of England, resulting in ships being driven ashore or, as in the case of this extract by Daniel Defoe, swept out of the safety of Helford harbour. With only one crew member and two boys aboard, a ship laden with tin, laying in Helford Haven on passage to London, dragged all four anchors. She was driven along the coast in violent winds and, on reaching the Isle of Wight, brought safely ashore by one of the boys. The beginning of the storm, there lay a ship laden with tinn, in Helford Haven, about two leagues and a half west of Falmouth. The tinn was taken on board at a place call’d Guague Wharf, five or six miles up the river, and the vessel was come down to Helford, in order to pursue her voyage to London. About 8 a-clock in the evening the commander, whose name was Anthony Jenkins, went on board with his mate to see that every thing was safe, and to give orders, but went both on shoar again, leaving only a man, and two boys on board, not apprehending any danger, they being in safe harbour; however, he ordered them, that if it should blow hard, they should carry out the small bower anchor, and so to moor the ship by two anchors, and then giving what other orders he thought to be needful, he went ashore, as above. About 9 o’clock, the wind beginning to blow harder, they carryed out the anchor according to the master’s order; but the wind encreasing about 10, the ship began to drive, so they carry’d out their best bower, which having a good new cable, brought lie ship up. The storm still encreasing they let go the kedge anchor; so that they then rode by four anchors a head, which were all they had. But between n and 12 o’clock, the wind came about west and by south, and blew in so violent and terrible a manner, that tho’ they rid under the lee of a high shore, yet the ship was driven from all her anchors, and about midnight drove quite out of the harbour (the opening of the harbour lying due east and west) into the open sea, the men having neither anchor or cable, or boat to help themselves. In this dreadful condition, they driving, I say, out of the harbour: Their first and chief care was to go clear of the rocks, which lye on either side the harbour’s mouth, and which they perform’d pretty well; then, seeing no remedy, they consulted what to do next. They cou’d carry no sail at first, no not a knot, nor do any thing but run away afore it: The only thing they had to think on, was to keep her out at sea as far as they could, for fear of a point of land, call’d The Dead Man’s Head, which lyes to the eastward of Falmouth Haven, and then if they could escape the land, thought to run in for Plymouth, next morning, so if possible, to save their lives. In this frighted condition they drove away at a prodigious rate, having sometimes the bonnet of their foresail a little out, but the yard lower’d almost to the deck; sometimes the ship almost under water, and sometimes above, keeping still in the offing, for fear of the land, till they might see daylight; but when the day brake they found they were to think no more of Plymouth, for they were far enough beyond it, and the first land they made was Peverel Point, being the southernmost land of the Isle of Purbeck, in Dorsetshire, and a little to the westward of the Isle of Weight; so that now they were in a terrible consternation, and driving still at a prodigious rate, by seven a clock they found themselves broad side of the Isle of Weight. Here they consulted again what to do to save their lives; one of the boys was for running her into the Downs, but the man objected, that having no anchor or cable, nor boat to go on shore with, and the storm blowing off shore, in the Downs, they should be inevitably blown off, and lost upon the unfortunate Goodwin, which it seems the man had been on once before, and narrowly escaped. Now came the last consultation for their lives; the other of the boys said, he had been in a certain creek in the Isle of Weight, where between the rocks he knew there was room to run the ship in, and at least to save their lives, and that he saw the place just that moment; so he desir’d the man to let him have the helm, and he would do his best, and venture it. The man gave him the helm, and he stood directly in among the rocks, the people standing on the shore, thinking they were mad, and that they would in a few minutes be dashed in a thousand pieces. But when they came nearer, and the people found they steer’d as if they knew the place, they made signals to them to direct them, as well as they could, and the young bold fellow run her into a small cove, where she stuck fast, as it were, between the rocks on both sides, there being but just room enough for the breadth of the ship; the ship indeed giving two or three knocks stav’d, and sunk, but the man and the two youths jump’t a shore, and were safe, and the lading being tinn was afterwards secur’d. N.B. The merchants very well rewarded the three sailors, especially the lad that ran her into that place.